Even with my hectic work schedule, I had the chance to get out to Star City Game's Season Two Invitational Event this past weekend in Roanoke, VA. While my schedule didn't allow me to stay very long, I did manage to sneak down there and get a few cards from my deck signed by some very cool artists. Just like Eternal Weekend 2017 event earlier this year, I didn't get to play any Old School games. Mainly because of the limited time I had and there weren't any Old School events being held at this particular event. Before it’s all over, I will figure out a way to attend a larger event and in addition to getting cards signed, I will actually play a game or two! I’m fortunate it seems that there are a number of larger events (ones that draw artists to attend) held each year within a relatively comfortable driving distance of where I live. This means I have the opportunity to get as many cards as I can signed without too much trouble. Kinda like a signature treasure hunt. Trying to find the events, see what artists will be where and getting their signatures has become a game in of itself for me. Card signing is something that I've started doing again and I really enjoy getting artist's signatures on cards in my deck. I'm not really concerned with any value change by doing so... I'd much rather have the memory and a cool story to tell someone when I play the card. 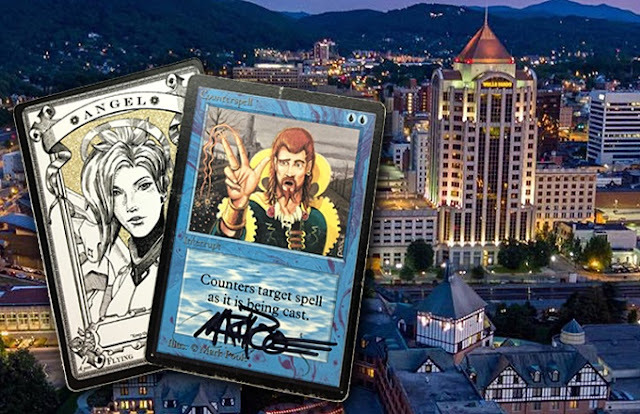 This weekend I wanted to get Mark Poole to sign a few of my cards that have his artwork on them. Playing Old School means I don't have many cards if any from the newer artists out there, but lots from the older artists. I also managed to pick up a pair of cool Angel tokens by RK Post that I might substitute into my deck for a couple of my white border Serra Angels. I like to get cards signed by my opponent when the situation warrants as well. If it was a particularly memorable match, I will ask them to sign a card that represents that match to me. You should see the look on some folks faces when you ask them to sign a card especially if it’s something they’ve never done before. Same goes for the occasional tournament I play in. I’ll pick out a card beforehand, mark it with the tournament information and have each opponent I play during the day sign it. For me, it’s a way to personalize the cards in my deck and create a visual history of my games. I look at certain cards and I’m reminded of amazing games that ended in some spectacular fashion or that one desperate play that kept me off the ropes just long enough to turn it around and pull out the win. Those are the things I enjoy reliving more than anything else. It’s the moments we’re collecting when we play, not the cards. IMAGE: City of Roanoke. A few of my cards after that day.